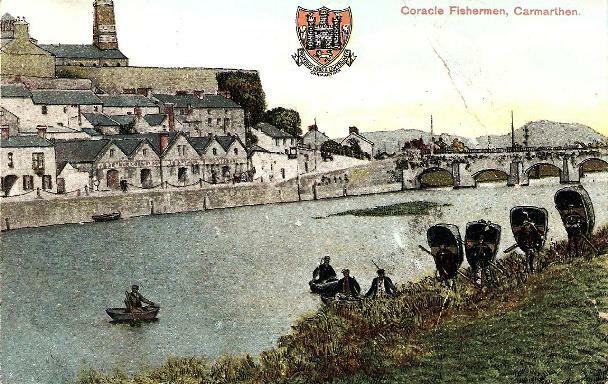 'Dusk was gathering swiftly as I crossed the bridge over the Towy into Carmarthen, and glanced idly seaward over the fast-running stream. Dimly I saw two blobs dancing oddly upon the water. Almost they had become a part of the darkening river, and I guessed, rather than saw, that they might be coracles. 'Outside the old Sloop Inn half a dozen shapes moved like ghostly beetles in a tribal dance, and I was glad that the chance sight of the two blobs had drawn me from the road. A few minutes earlier, or later, over the bridge they call Bont Gaer, and I should not have seen them, and not seeing, should not have given them a thought. For coracles were not in my mind. 'Even then, as I watched the men slip their strange crafts from their backs, and smooth the neat bundles of their nets, I was not hopeful of a close acquaintance. 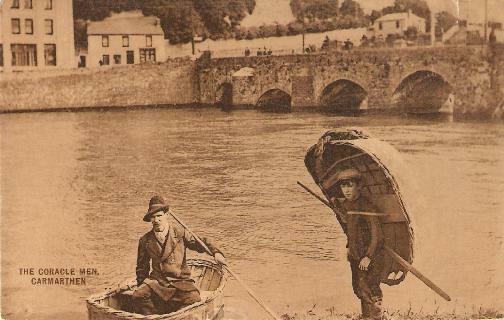 Perhaps, I thought, this ancient breed of Wales, tracing their descent through centuries of coracle fishers, might have unpleasant ways with "foreigners." Perhaps, like the inhabitants of Llansaint, they spoke a dialect of their own. 'So I waited in silence, watching their movements, seeing them prepare their nets and lower their coracles into the racing water. The river was falling perceptibly lower against the quay wall, and it seemed madness to embark in such fragile "baskets." '(...) But I need not have concerned myself with their friendliness: I had tumbled unwittingly amongst an aristocracy of fisher-folk, ready with warm welcomes and easy friendliness. 'The coracles stood upright against the wall of the inn, and I lifted one on to my back to feel the weight of it. It sat easily and snugly, held by a strap across my chest, the narrow seat against my shoulders, so that it felt less than its twenty-eight pounds. Beneath the seat was a board to form a box to carry the fish. The broad, curving prow of the coracle made a wide cowl over my head, giving a feeling of comfort. Thompson, R.W. (1937) An Englishman Looks At Wales, Arrowsmith.